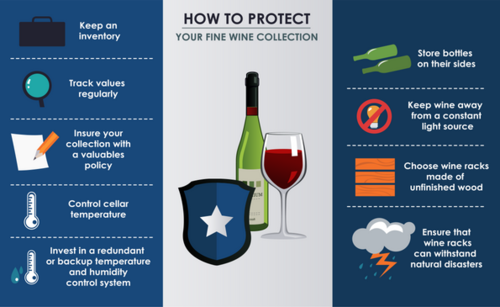 essential tactics for protecting your fine wine collection. paramount to your success as a collector. to track the value of each bottle. always, a greater investment in protection yields better results. and ruin the flavor of wine. storing your fine wine wine collection. temperature of a poorly-controlled wine cellar. contract, damaging the cork and causing oxidation to occur. invest in a temperature control system, which can be accessed via smartphones. fine wine collectors incorrectly assume that natural light is not damaging. light can cause significant damage. will not work if you are not home to start it up! can be the determining factor to recoup your investment that took years to build. brings forth many pleasures that far outweigh its risks.